The project was delivered under a design-build model with very wide scope to provide for 2 million cubic meters of storage at the site with a tank life of 100 years. The approach was fast-tracked and eventually accelerated to meet the challenges the city was facing throughout their distribution system, particularly during maintenance of the desalination plants and the water demand surges associated with pilgrimages to Makkah and Madinah. CDM Smith contractual role and responsibilities were the review and the approval of all design and the supervision and construction management of the works contract being performed by the D/B Contractor and set up the necessary organization to facilitate efficient administration of requisite activities. The project is Phase I of four phases to ultimately secure 6 million cubic meters of strategic water storage. The 11 reservoirs are considered the largest in the world using prestressed concrete tanks with horizontal post tension tendons and vertical post tensioned rods using the Freyssinet technology. The project was recognized by the Guinness Records as the largest water storage facility in the world. In addition to the tanks, the scope included all site yard piping (up to 2600 millimeters in diameter), flow meters, valves, chlorine gas disinfection facility and rapid mixing chamber, site roadways and drainage systems, administration building and complete SCADA control. CDM Smith provided design review and approval and site supervision services for the construction of the 2 million cubic meter for the first phase of the strategic reservoirs plan for Jeddah, which will be located at the Briman Facility of the National Water Company (NWC), including works supervision for Buildings (Laboratory, Disinfection, SCADA, and Administration), site drainage, and emergency open channel spill system, and access Roads. As supervision consultant, CDM Smith provided the leadership, technical expertise and necessary resources in design and construction to support NWC in successfully delivering this strategic project. CDM Smith has performed administration and supervision of the Works Contract including but not limited to the following: Early construction activities; Develop site offices for CDM Smith and NWC; Administrative/assistance tasks; Review and approval of the project design and recommend approval contractor’s submittals; Work supervision; Health and safety labor conditions; Provide training for knowledge transfer to designated NWC staff; Provide technical and contractual support during Defects Liability Period to monitor the successful completion of the Construction Contract of the subject project; Hydraulic modelling of large diameter yard piping (additional work order); and Highway crossing of large pipe diameter transmission main from Briman reservoirs to the city water supply network (additional work order). CDM Smith also reviewed Atkins and Freysinnet’s design proposal in a seminar held in the UK in February 2013 and began the review of formal design submittals and shop drawings immediately after formal appointment in early April 2013. Supervision commenced at the site in May 2013 and was completed in July 2016. Based on early successes in achieving the Client’s acceleration goals and milestones, the Client awarded them an additional three tanks that raised the total storage capacity from 1.5 million cubic meters to 2 million cubic meters. NWC awarded CDM Smith an Appreciation Letter for the excellent services rendered on this strategic project. The project was achieved with the highest safety for a construction site on a fast track delivery. An aerial view showing different construc­tion stages of the reservoirs. Construc­tion progress of the reservoirs. Construc­tion works on the walls of reservoir number 9. A view showing the admin­is­tra­tion and chlo­ri­na­tion buildings and strategic reservoirs. A view of the perimeter drainage channel, chlo­ri­na­tion and admin­is­tra­tive buildings, valve chamber, and strategic reservoirs numbers 6 and 8. An aerial view of reservoirs numbers 10 and 11 during blinding, insulation, base slab, column, and walls construc­tion works. A view showing horizontal post-tensioning ducts on reservoir number 9. A view of the road and utilities between the constructed reservoirs. An aerial view of the constructed reservoirs. 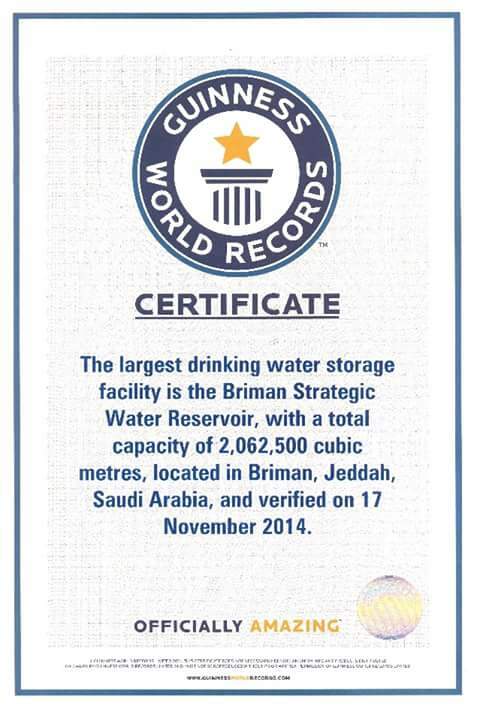 In 2014, the project was recognized by the Guinness World Records as the largest water storage facility in the world. NWC issued a letter recognizing CDM Smith's outstanding works and performance that resulted to the successful completion of this project.